Our high-performance Super Alkaline Batteries lasts 20% longer than ordinary alkaline battery. The battery features top quality performance with maximum reliability, anti-leakage system and anti-short circuit design. It is safe and clean to use and environmental-friendly with 0% mercury and cadmium. The very popular, multi-use premium battery are available in the common AAA, AA, C, D and 9-volt size. The PP3 or MN1604 battery us used in a wide variety of Toys, radios, smoke alarms and remote control devices, Our PP3 or MN1604 alkaline batteries offer high capacity for a long battery life. Advantages︰ Now also available as a 9V/PP3 battery. 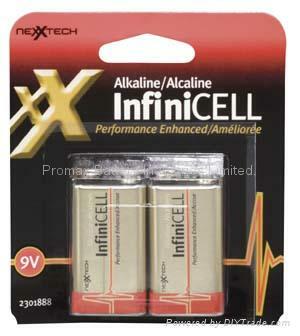 The range of our alkaline batteries is getting really close to unbeatable value. But the rock bottom price doesn't mean you compromise on performance. You're getting a high performing alkaline battery, which in all but the most demanding applications will perform as well as any other alkaline battery. Copyright 2009 Promax Battery Industries Limited. All rights reserved.